It’s the essence of risk management, and one of Wall Street’s oldest sayings. True market skill is not illustrated by how much money you can make when markets are going up, but how much you can keep when markets are going down. It’s a version of the “never confuse brains with a bull market” adage, and speaks to the often-ignored risk side of the investing equation. First, consider the current rate environment. “Meager” doesn’t even begin to describe it. There is now $9.9 trillion of negatively yielding debt spread across 14 countries, and investors around the world have bid up bond prices to ridiculous levels. How much upside can exist when starting points include 3% on a U.S. investment-grade bond, 1.78% on a U.S. 10-year Treasury bond, and a mere 0.86% on a 30-year German bund? In a relentless search for yield, even emerging market debt has gone stratospheric – EM sovereign bonds yield, on average, a mere 5%. Argentina just returned to the capital markets 15 years after a default and managed to sell $2.75 billion of 30-year paper at only 7.62%. The point is that investors are reaching for yield to an unprecedented degree. Ray DeVoe, one of the best market minds we’ve ever known, once said that more money has been lost reaching for yield than at the point of a gun, and we think he’d be rubbing his eyes at some of the yields investors are willing to buy today. Risk, which is never far from our minds, seems to have completely receded from those of most fixed-income investors. In our view, it is extraordinarily unlikely that the current yield environment properly compensates investors for the risks they are taking. This is why the future for private debt specialists like Old Hill Partners is extremely bright. In our corner of the credit markets, individual transactions can be highly customized and risk actively managed. We know our issuers inside and out, we know their collateral, and we know their businesses. Elsewhere, such as in high-yield bonds, this is not the case. As the default cycle ramps up over the next few years, investors will learn that in traded credit markets, risk and yield are inversely correlated. 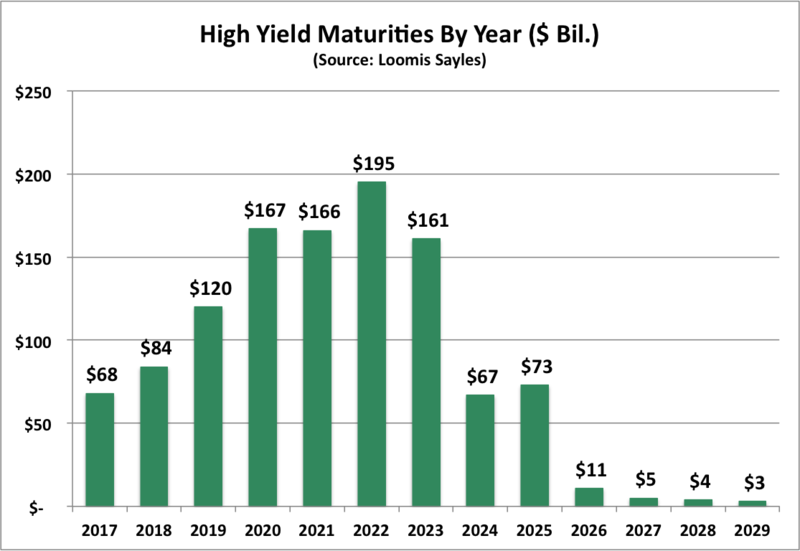 Consider: A junk bond maturity “wall” looms in 2019-2022, during which hundreds of billions of dollars of high-yield debt and bank loans will mature. The total is nearly $440 billion by the end of 2020, according to Bank of America Merrill Lynch. This wall represents nearly 25% of the entire leveraged finance market, and will send a horde of issuers back into the market looking to refinance at the worse moment in a generation. Record low interest rates have allowed corporations to refinance maturing debt on very attractive terms over the past few years, pushing out the now-infamous maturity wall. However, capital markets are not likely to cooperate at that point. A lethargic economy coupled with higher interest rates and a spiking default rate will make underwriting debt at anything near current levels a pipe dream. Accordingly, a good old-fashioned credit cycle washout could be dead ahead, from which junk bond investors could recover as little as $0.15 on the dollar, according to none less than DoubleLine’s Jeff Gundlach. In contrast, every transaction undertaken by Old Hill has survived an extraordinarily rigorous screening and structuring process that seeks to mitigate risk. It’s woven into our DNA, and is a cardinal difference between the yields available from prudent private debt investing, and those from high yield bonds. It is why private debt has been – and will continue to be – among the fastest-growing and best-performing asset classes in the world. Each month, we like to include an example of a transaction Old Hill is either considering or has rejected as a way of illustrating our overall approach. Given the theme of this month’s update, we wanted to profile a deal on which we ultimately passed despite it having a number of attractive characteristics. The company in question is a specialty finance firm that provides small business short-term working capital loans, also known as merchant cash advances. We are very familiar with this asset class, and initially viewed the transaction as way to engage with it at favorable advance rates and pricing. However, we see a large number of merchant cash advance opportunities, and are picky about which ones we choose to fund. We work with companies that have strong underwriting process, rather than those simply buying loans from brokers. Since the company directly originates and lends on the loans it closes, it is the first line of defense in terms of risk. As a result, the current loss rate is 1%, which illustrates strong underwriting control. Further, the company screen applicants with credit scores, site inspections, industry databases, background checks, business owner interviews. Initially, we were attracted to the company’s underwriting strategy, boasting a significant underwriting team led by industry veterans. At the moment, the group is selling away the majority of their own loan origination because of balance sheet capital constraints, which demonstrates a significant untapped revenue stream and the reason the company was seeking outside financing. The loans originated by the company average $40,000, and are typically 3-6 months in duration. A significant number of the company’s clients become repeat customers. All in all, not a bad set up as merchant cash advance companies go. However, our due diligence process quickly turned up a red flag. We were initially interested in this group because of the strong underwriting process, a robust track record, and what we thought was great deal of their own capital invested in the business. As we started to dig deeper and started putting some thought into a term sheet, we began to request data from the company about loan vintages, performance, defaults, etc. While they provided initial details, requests for the supporting data were not met. Moreover, we learned they did not have systems in place to track the metrics we needed to run our models in order to price the transactions. We see this from time to time. Companies that have made a great deal of money with a business model tend not to spend the time, money or effort to institutionalize their data tracking efforts. However, when it becomes time for outside funding, the lack of such systems becomes a major headache, and in this case, prevented us from proceeding with the transaction. This deal illustrates how Old Hill’s due diligence process not only focuses on the obvious risks to our capital, but also on those that can come from a company’s infrastructure (or lack thereof). We did not pass on this deal because of any concrete concerns about default; rather, we declined because we didn’t feel the issuer had the right systems and procedures in place for us to adequately assess its business and, by extension, our risk. Such insights are just one example of the many things we consider when evaluating a deal, and are a good illustration of how properly vetting private debt transactions can provide attractive returns with much less risk than their yields would normally suggest.